NOTES: Full resin kit with metal landing gear and a CD with photos and modeler's notes. The AJ Savage was a large composite-powered carrier-borne Attack Bomber designed to deliver nuclear ordnance. It also performed photo reconnaissance duties and later on was used as an aerial refuelling platform. 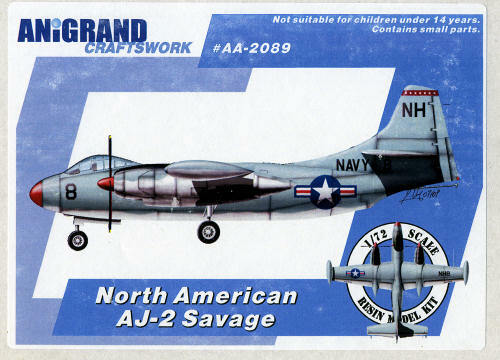 The North American AJ-1/2 and AJ-1/2P Savage aircraft were in a number of USN Heavy Attack Composite squadrons from 1948–1956, as well as in several Photographic Reconnaissance squadrons. The Heavy Attack versions were the first nuclear bomb carrying bombers able to be launched from and recovered on aircraft carriers. The date of its inception was a time where the US Navy was faced with procuring the nascent jet engine, while still having to rely upon the simple yet well proven reciprocating engine. Jets at this time were unreliable and used large quantities of fuel; however, once they were developed, they produced performance that no piston engine could ever provide. A compromise was made to include in the Savage two Pratt & Whitney R-2800 piston engines, with a large turbocharger fitted inside each engine nacelle. This combination made it possible for the R-2800 engines to produce rated power (2,500 hp/1,864 kW) up to 42,000 ft (12,802 m) altitude. An Allison J33 turbojet was fitted in the rear fuselage. Interestingly, both engine types used the same fuel. The piston-turbojet arrangement was intended to give added power on take-off and extra dash speed while in combat. At high altitude, this 'boxy' looking (but aerodynamically very clean) airplane was remarkably fast - more than 460 mph (740 km/h), when the jets of that era were not very much faster. The first production Savage flew in May 1949, with the first carrier landing of the type taking place on the USS Coral Sea on 31 August 1950. Early model Savages (AJ-1) were converted to the air tanker role, with the bomb bay filled with all the necessary equipment, including hoses, fuel pumps, electric power drive, and the drogue. Additional fuel was provided in drop tanks. AJ-1 tankers were used to refuel John Glenn's F8U Crusader during the Project Bullet transcontinental speed record flight. The AJ-2 first flew on19 February 1953 and had uprated engines and a taller vertical stabilizer and non-dihedral tailplane. This latest kit from Anigrand incorporates a new feature from this company; cockpit interior detailing. A first for Anigrand and one that I hope we will continue to see. Having this as part of the kit means greater attention to quality control to prevent any resin blobs or unwanted air pockets in this are. It seems to have worked as the last few kits have also been glitch free in the wheel wells, where these things often form. It is not all roses as you'll still find some small voids on the wing tips, lower engine intake lips and on the side of one of the wing nacelle sections, to name a few. I also found a few pits, but these all are relatively easy to fix and to be expected. One of the nice surprises is that there is detail in the cockpit. Not only on the sidewalls, but on the instrument panel as well. The seats are well done and while not as spindly as the originals, give a good impression. One does need to do well in the interior as the resin canopy section is very clear and you'll be able to see what's inside. This has engraved frame lines making masking a snap. Test fitting the parts shows that considerable work has gone into engineering. 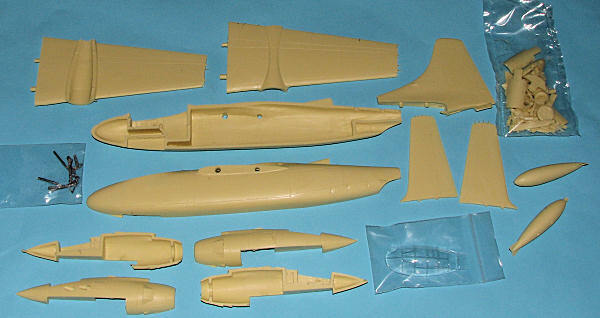 The engine nacelles fit well onto the wings, the fuselage halves match up well and the fit of the canopy is very good. I even was able to get very good joins on the wings as well. This one looks to be a pleasure to build. I do notice from the modeler's notes that the tail hook attach ment area is pure fiction, but the correct shape is given in the notes for those who wish to make the correction. The kit comes with metal gear as well, a real plus as it will take considerable weight to prevent tail sitting. These are nicely cast as well and should look even better with a touch of file work to clean off the seams. I am impressed with the level of detailing on the engine nacelles. These are not simple items to mold, yet Anigrand has done a bang up job getting all the various intakes and vents in the proper location. I understand that much research went into doing this one right the first time with noted author and historian Tommy Thomason being very much involved. Typical of Anigrand, you get several smaller decal sheets to make into one set. 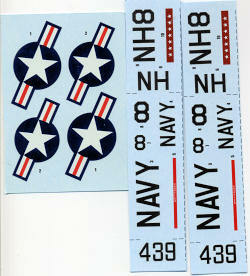 The strip sheet is doubled up and a generic set of insignia is included. Instructions are the usual exploded views with detail information. The unit chosen for the markings is not listed. I'm also not 100% on the red nose. Only on the plane at the USN Aviation Museum have I seen this. Other color images I've found of the plane show it black or a tan fiberglass color. I was very much looking forward to building this one, and so far, I have not been disappointed at all. This is the best fitting Anigrand kit I have ever worked on and it is a subject that I'm so very pleased to see released as a proper kit. I know that Mach 2 has one out, but even without having seen it, I can tell you that this one has to be more accurate and a better build. Nostalgic Plastic have told me that the first run has sold out and a second is being done as I type to make up for orders. Tells me that this one is a real winner. My thanks to www.nostalgicplastic.com for the preview kit. You only get the additional CD if ordering from them.